Long involved as a songwriter for musical theater, “SCORES” finally gives the superstar singer-songwriter the chance to record his personal renditions of songs he has written for two of his major musical properties, Harmony and Copacabana. HARMONY, is based on the true story of Germany’s “Comedian Harmonists.” Recognized as the world’s first superstar boy band, The Comedian Harmonists enjoyed worldwide album and movie success before being forced to disband by the Nazi regime. Based on a book by Bruce Sussman, the songs for HARMONY were co-written by Manilow and Sussman. After phenomenal reviews during its regional production at the prestigious La Jolla Playhouse, HARMONY is scheduled to open on Broadway during the next season. 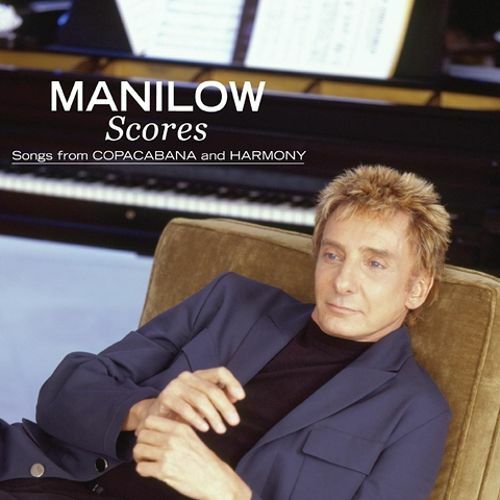 COPACABANA, which Manilow wrote along with Bruce Sussman and Jack Feldman started as a worldwide number one hit song in 1978 before morphing into an original musical movie made for CBS television and then ultimately a musical for the stage. COPACABANA enjoyed a successful 14 month run on London�s West End before an 18 month tour of the UK. Since then, there have been more than 100 productions of COPACABANA: The Musical on stage throughout the United States, the Netherlands, Canada, Europe, and India. Includes seven songs from each of the productions, “SCORES” is being co-produced by Manilow and legendary, multi-Grammy award winner Phil Ramone.